Quinoa Salad is fast and easy to make, AND packed with plant protein! 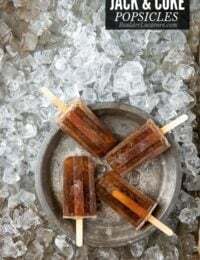 This version is loaded with other tasty ingredients, Mexican seasonings and green chilies! 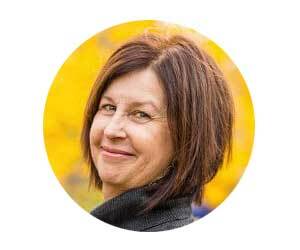 Originally published September 2016; updated August 2018. My favorite summer salads are loaded with lots of colorful ingredients, fresh seasonal produce and great flavor! 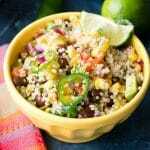 Mexican Quinoa Salad with Green Chilies is a favorite! 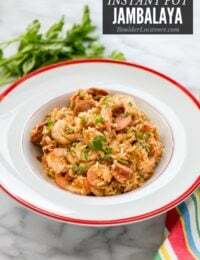 It’s easy and fast to whip up and can be paired with many dishes or eaten solo! 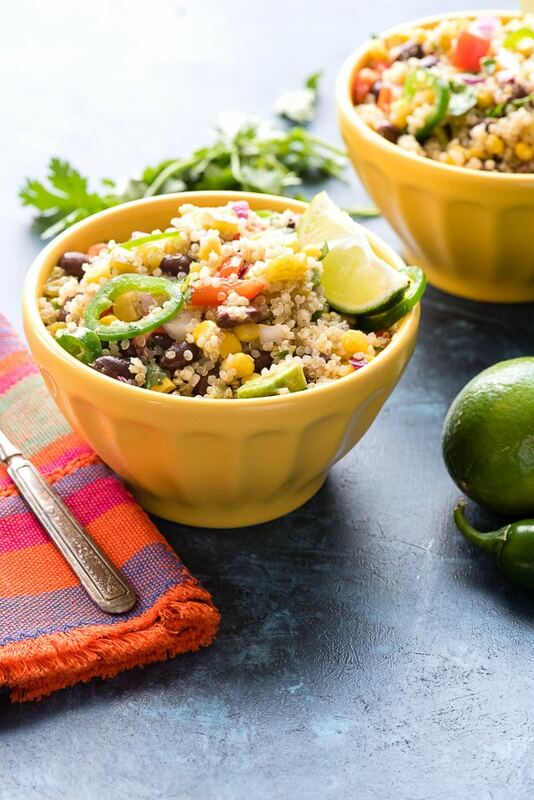 This Mexican-flavor inspired Quinoa Salad can be a warm side dish or chilled salad. 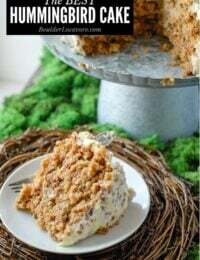 It’s colorful, loaded with vegetables and high protein quinoa giving it a great texture and crunch. 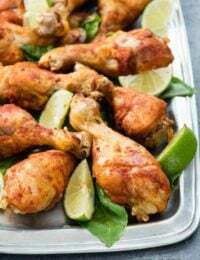 Drizzled with a slightly spicy cumin lime adobo dressing gives a bit of a kick! 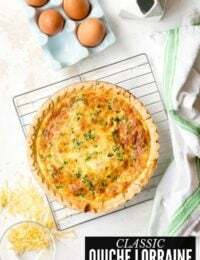 With some thinly sliced fresh jalapeno in the mix it has a great bite! 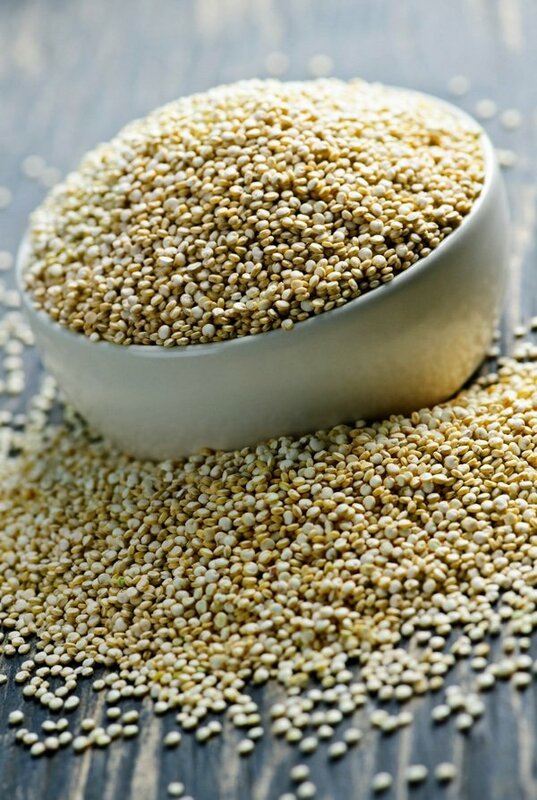 Quinoa (pronounced keen-wah) has become the ‘it girl’ of super foods in the past years. There’s no surprise why. It’s a protein packed tiny grain. In fact, it’s considered a ‘complete protein’ meaning it has all the essential amino acids making up a protein. 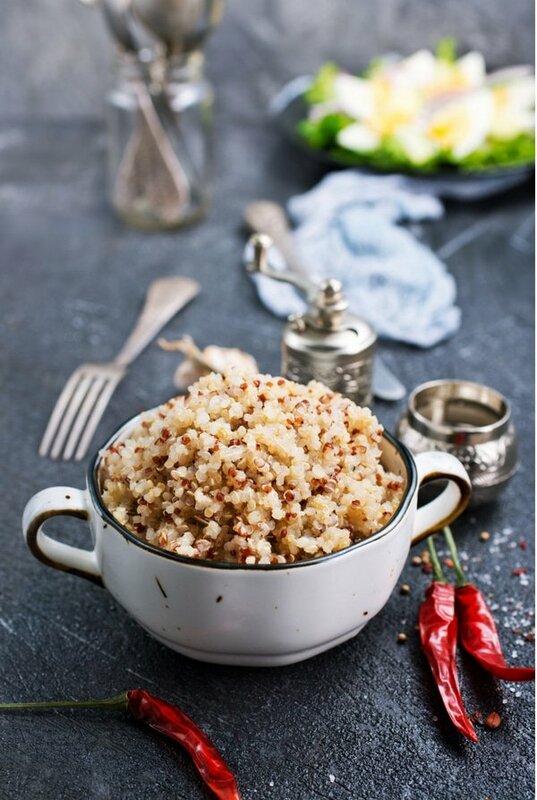 Quinoa cooks quickly (15-20 minutes), has a subtle flavor and a great texture or ‘bite’. 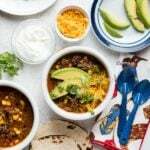 It works well in everything from breakfast recipes like Overnight Quinoa-Chia Chocolate Breakfast Pudding to side dishes, or main dishes like Lean Turkey Black Bean Quinoa Chipotle Burrito Bowls. Quinoa comes in different colors too: red, white, black, rainbow (a mixture). It is easily available in grocery stores or online. 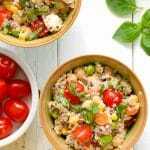 Quinoa salad is a warm or cold salad made of cooked quinoa and other ingredients. Swapping quinoa in the place of a pasta or potatoes makes the salad higher in protein. Because of its subtle flavor it mixes well with most ingredients and is easy to flavor in ethnic foods. Quinoa salad is a fun change up for mix salads and is fast to make. My flavor ‘go to’ is always Mexican when I want an easy dinner recipe or flavors to grab attention. 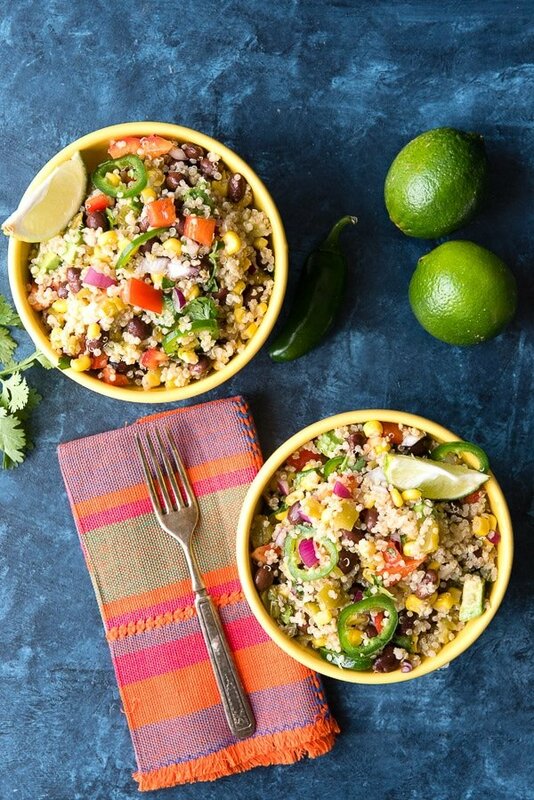 Mexican Quinoa Salad is no exception. 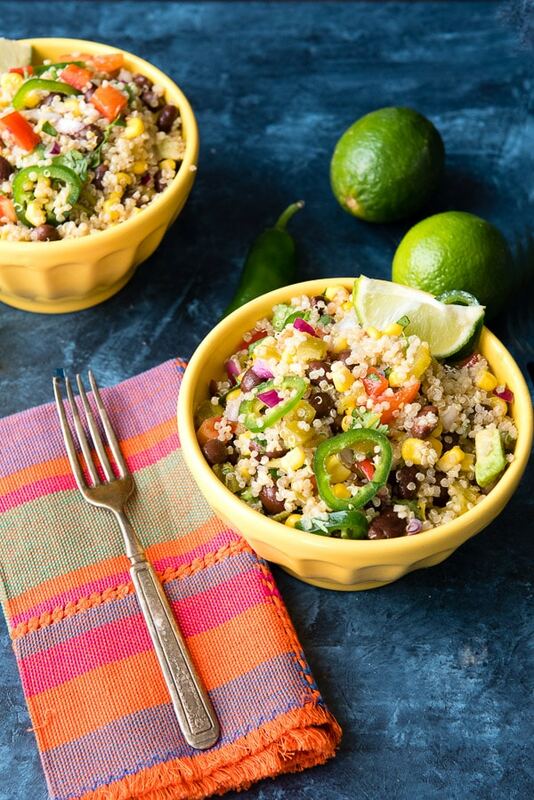 Cooked quinoa is mixed with black beans, red onion, sweet bell pepper, corn, avocado, green chiles, jalapenos and some savory spices. One thing I love about this salad is the flexibility to change up the look by using different colored quinoa. It gives the salad a different feel all together. The sweet peppers can be changed too to use yellow, orange, green or red. 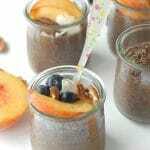 I’ve made Black Quinoa with Brown-Butter Sage Butternut Squash and Pepitas into a healthy recipe perfect for Halloween. Rainbow Quinoa is fun as it includes three colors of quinoa. Any type you use will cook in about 15-20 minutes and has a great satisfying texture! With grilling still being a mainstay I love this quinoa salad with grilled or roasted meat such as Grilled Kabobs, Steak, or Salt and Pepper Roasted Chicken Thighs. Smoky Grilled Chicken & Vegetable Quesadillas would be great too! My rule of thumb is usually to pair something spicy or with big flavor with something more neutral they complement each other. This tasty salad is great chilled or served warm as a side dish. 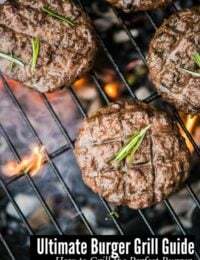 Light and bright, it's easy to prepare and is chock full of great nutrition as well as spicy, full flavors. 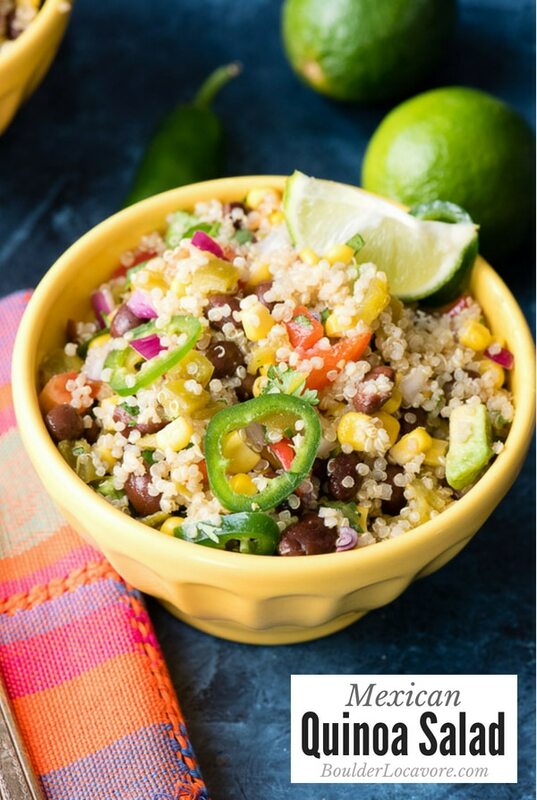 In a large bowl combine the quinoa, black beans, corn, green chilies, onion, bell pepper, jalapeno slices, avocado and cilantro. Gently stir to combine. 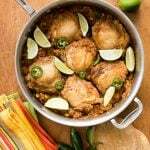 In a small mixing bowl, combine the olive oil, lime juice, cumin, cayenne, garlic and adobo sauce. Whisk to combine and drizzle onto the salad; toss to combine. Taste and as salt to taste. Maybe served warm or chilled before serving. I know for sure this would be a huge hit in my house! This looks absolutely delicious! Yummy! i could eat this all week long!! Can’t wait to make it! I’m always looking for flavorful dishes that pack a protein punch….perfection! Loving all the flavors in this salad! I think I’ve found my new favorite lunch! I LOVE the different flavors in this dish! It sounds fantastic!! What a great filling combo! This salad has amazing flavors! This looks like such a good combo! Thanks for sharing !! Quinoa makes such a great salad, and these Mexican flavors make it delicious! We love this as a healthy dinner. Awesome flavors!